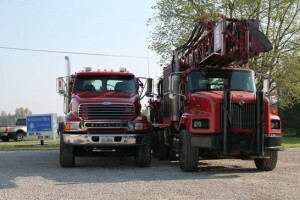 Beinhower Brothers Drilling Company offers both rotary and cable well drilling. The types of drilling we construct are listed above. Water Well Drilling – Steps to a Great Water Source! The process of drilling a water well begins with research. What is the well going to be used for? Who is using it and how much water? What type of geology might be encountered? We begin our research by asking potential customers certain questions related to water usage and their expectations. This information allows us to provide a proposal that reflects aquifer type and anticipated well drilling depth. Most areas in central Ohio are blessed with an abundant water supply, but specific geology can only be determined by drilling. Our experience with underground formations allows us to design the best quality wells. We believe that we are responsible for the care and protection of our natural resources; therefore, our well construction process protects the aquifer. The way a driller develops the water-bearing formation (aquifer) can determine the amount of water that will enter the well. The easier water comes into the well, the more efficient and higher quality the water will be. The cost of treating or conditioning water is less when the well is constructed properly. 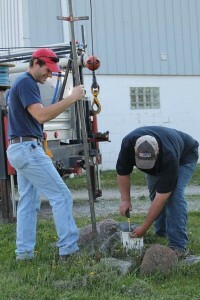 At Beinhower Brothers Drilling Company we construct the highest quality water wells possible. The TRUTH is – your water supply has a significant effect on your health, so it is wise to construct the highest quality well possible. Not only will your body benefit, but also the plumbing and fixtures throughout your house. Why wouldn’t you want to construct the highest quality well possible? 97% of the earth’s water is salt water consisting of oceans and seas, and 2% is stored as fresh water in glaciers, ice caps, and snowy mountain ranges. This leaves only 1% for our daily water supply needs.